After the scenic South Devon Railway (SDR) enjoyed a record increase in visitors during last week's February Half Term week break with a 14% increase in traffic on last year, the seven-mile line has another reason to celebrate this spring. One of its stalwart locos, former GWR ‘Prairie’ Tank 55xx No. 5526, has now clocked up over one million miles in service. Built in 1928 at the GWR's renowned Swindon works, the engine saw service all over the West Country in Cornwall, Devon, Wiltshire and Bristol before being withdrawn in 1962 and sold for scrap after working 968,577 miles. The engine then languished in Woodhams famous scrap yard for another 23 years before being rescued by a group of steam enthusiasts who then set about restoring it in 1985. For the next few weekends in March, the million-mile engine 5526 will share the spotlight with the SDR's diesel ‘Bubblecar’ amidst glorious spring scenery along the River Dart. The idea behind this double billing is to show the changes that took place on West Country branch line railways during the 1950s & early 60s when the "new technology" diesel railcars started to gradually replace steam on the rail network. Now restored in British Railways plain black livery, loco 5526 will be working the mysteriously named ‘auto train’ on selected Sundays in March (6th, 13th and 20th). The name ‘Auto-train’ comes from the way in which the driver operates the locomotive's controls ‘automatically’ from the end cab of the leading carriage instead of from the engine. This happens via a clever system of rods and cables. Authentic 1950s passenger coaches complete the scene. Auto trains would usually consist of just one or two coaches worked in push-pull mode by a small locomotive. A few of the GWR 55xx Class 2-6-2 "small prairies" were also equipped to work auto trains, and the South Devon Railway fitted 5526 with the necessary auto gear to allow the sights and sounds of a genuine auto train at work to still be enjoyed. In direct contrast, the SDR is also running a type of diesel train which replaced ‘auto-trains’ on West Country branch lines, known as a "Bubblecar" on Saturdays in March (5th, 12th and 19th), plus Monday 28 March and Friday 1 April. Recently restored to its original green livery, the diesel Bubblecar W55000 used to operate in the West Country and worked services to places such as Kingsbridge and Brixham - now of course long removed from the railway map. At Buckfastleigh the museum, which is being fully refurbished, will be open. Displays for the 2011 season include an 0-4-0 saddle tank which once worked at the Gas Works in Exeter. Painted blue and named "Ashley" the locomotive is very popular with the younger visitors to the museum many of whom enjoy the chance to visit the footplate. Also housed in the museum is the last surviving locomotive that ran on Brunel's famous Broad Gauge system, the 0-4-0 vertical boilered "Tiny" that is part of the National Railway Museum collection and on loan to the S.D.R. Refreshments will be available at Buckfastleigh, from the main refreshment rooms, and souvenirs, together with an extensive range of model railway items and equipment, can also be purchased from Expressway Models. The weekend train services start at 10.45 from Buckfastleigh on both days, and at 11.30 from Totnes. 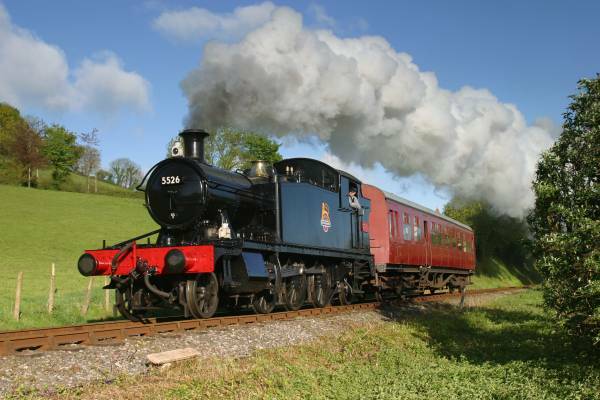 The South Devon Railway will be running trains EVERY day from Saturday 26 March until the end of October.